RASUWA, Aug 15: The Dhunche-Gosainkunda trekking trail, which was obstructed for the past 10 days due to landslide, is now open. The Kalijung Battalion of Nepal Army stationed at the Langtang National Park repaired the trail. According to Captain Ashok Buda Khampa of Nepal Army, the army cleared debris on the trail keeping in view the upcoming Janai Poornima festival when the number of people reaching the sacred Gosainkunda Lake increases manifold. 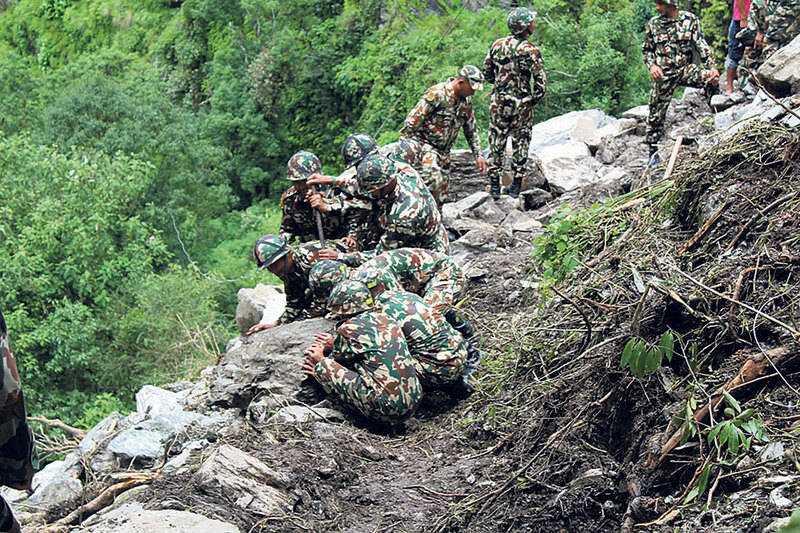 Nepal Army soldiers cleared debris on 30-meter segment of the trail, according to the battalion. Thousands of pilgrims reach Gosainkunda Lake to celebrate Janai Poornima festival every year. More than 90 percent of them use this route to reach the sacred place. There are four walking trails to reach the sacred place i.e. Dhunche-Gosaikunda, Thadepati-Gosainkunda, Yarsa-Gosainkunda and Sagarkunda-Gosainkunda. However, most of the pilgrims use Dhunche-Gosaikunda trail regular bus service is available to Dhunche -- the district headquarters of Rasuwa -- from Kathmandu. The trail passes through popular villages of Chandbari and Lauribina. Another route is from Sindhupalchowk district, trekking from Sundarijal of Kathmandu to Helambu and Thadepati before reaching Gosainkunda. However, only few of the pilgrims use this route. The number of pilgrims and trekker using the Sagarkunda-Gosainkunda route is negligible. Gosainkunda Lake, which is also a Ramsar site, is also a popular attraction among foreign tourists visiting Langtang National Park. Most of the foreign tourists coming to Gosainkunda are from France, Germany, Israel, Korea, Japan and the Netherlands. According to Langtang National Park, the major purpose of people visiting Gosainkunda is pilgrimage and trekking. Some also visit the place to study geology and biodiversity of the area, say officials of the national park. The lake, which is situated at 4,380 meters above sea level, remains frozen for six months during winter season.